Sometimes it isn't easy thinking of things to do at the weekends. For a childless couple, it isn't so difficult. A typical weekend might involve a bit of shopping, lunch in a restaurant somewhere, maybe a stroll in the town, possibly a romantic meal together and an evening out at the cinema and/or bar hopping and night clubs. For parents, it's not as simple as that. Whenever you consider going somewhere or doing something, you have to think of the kids first. "Is there a playground there? ", "what can they eat? ", "is it expensive?" and "will she like it?" are just some of the questions you have to ask yourself. You have to put yourself in the kid's place as well - museums and shops are boring for kids, so those are out. Restaurants can be tricky as well, as kids aren't great at sitting in one place for a reasonable period of time. It's even worse when it rains. Unless you dress your kid up in waterproofs, most outside activities are out of the question. On those days, you have to pray for a break in the rain that lasts long enough to go outside for a while, and let the kid burn off some of their seemingly boundless energy. Fortunately, this weekend the weather was nice. The sun was shining and the forecast predicted around 20°C, so not too shabby. 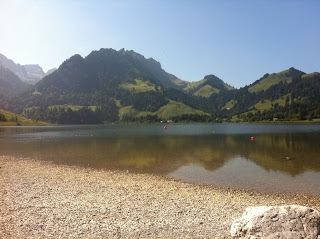 We decided to head over to the Lac Noir in the Swiss Canton of Fribourg, as we hadn't been there before and it would make a nice change of scenery from our usual trips to towns along the edge of Lac Léman. The drive to get there was fairly long, although it may only have seemed long because Lydia got a bit whingy. We bought a CD of French children's songs, as well as French spoken versions of Pinocchio and the Little Mermaid. These were played on a loop during the drive, and for the most part kept Lydia entertained. From a personal point of view, I found the stories to be a bit repetitive at the third time of listening. When we arrived at the Lac Noir, it was immediately clear that it's a very picturesque setting. 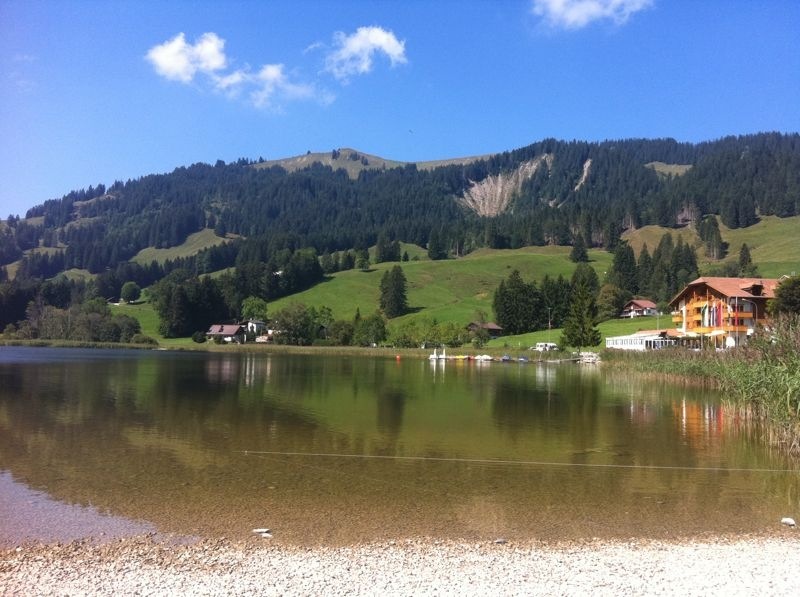 The lake itself is fairly small (0.5 square km compared to Lac Léman's 580 square km), and is surrounded by green hills and mountains. 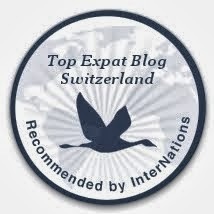 It's in a German-speaking part of Switzerland, although most people here speak at least some French as officially Fribourg is a bilingual Canton. We picked out a spot on the green next to the lake and had a picnic lunch. Lydia amused herself by wandering around a waving to everyone she saw (she's a very sociable little monkey!). 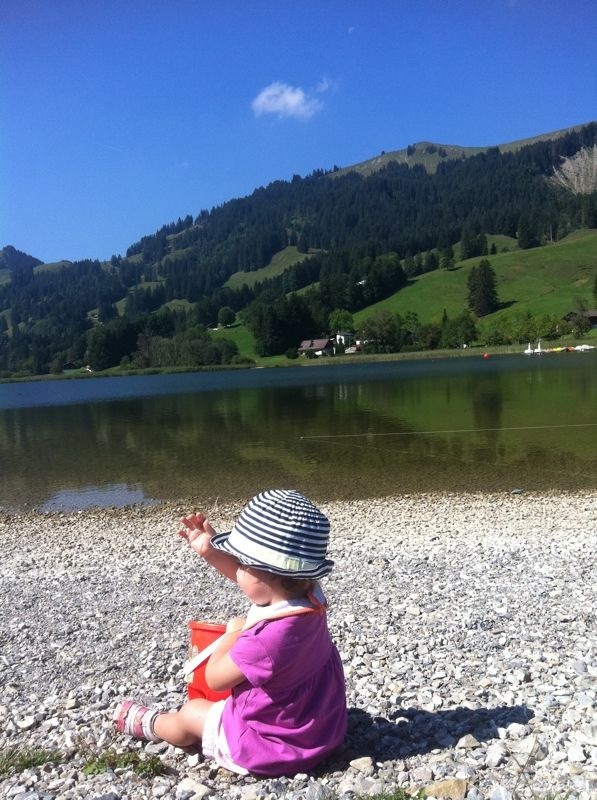 She also played with the little stones on the "beach" next to the lake. When she got fed up we went for a walk around the lake to see what there is. We found a good, wooden children's play area (which Lydia really enjoyed), plus swings, see-saws, etc for kids. We also came across a toboggan ride where you are dragged up to the top of a hill and then ride down a track on your toboggan, controlling your speed with a hand brake. 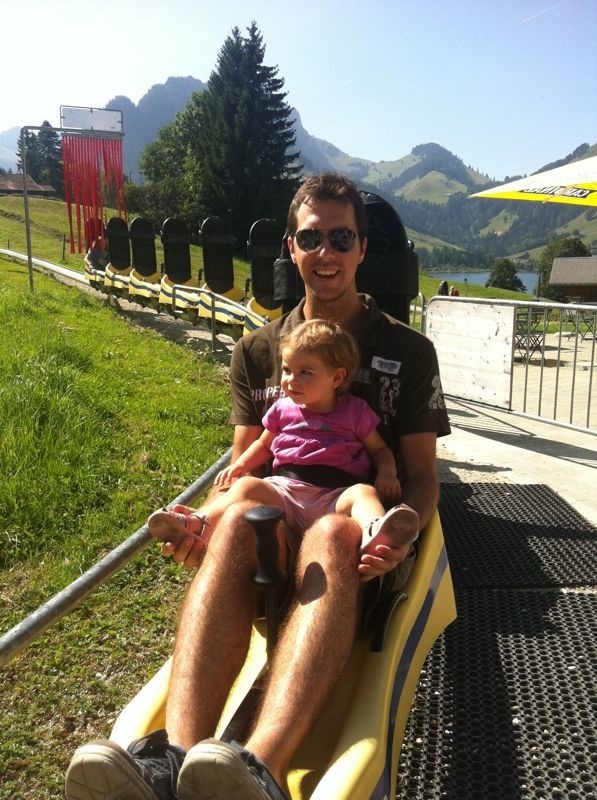 I had a go on this with Lydia, and although she didn't really enjoy the slow drag up to the top of the hill (as it involved sitting in one place for longer than 30 seconds), she really loved the descent. Of course, I kept my hand on the brake to make sure we didn't hit the corners too hard, but even so it still went pretty fast. Lydia is a little speed-freak so the faster we went the more she enjoyed it. She loved it so much that we had to go again for a second ride. As with the first go, she didn't enjoy the ascent but then laughed her head off going down the track, getting buffeted around as we went round the corners. We left the toboggan (despite Lydia's protests) and walked back towards the lake where we stopped to see if we could get on the chairlift to go up to the top of one of the mountains next to the lake. It was a bit pricey (about 20 CHF each I think), and as the only thing at the top - aside from a nice view - is a restaurant, we decided it isn't really something that Lydia would enjoy. Instead, we bought ice creams at a little café/restaurant and ate these by the lake. Lydia started to get a bit cranky as this was usually her nap time, so we made our way back to the car. From here we watched a few people doing parasailing (Lydia is enthralled by this), before driving back home. All in all, the Lac Noir was a very nice place to visit. We didn't go round the lake itself, but it is very pretty. Definitely something to remember for future day trips, and when Lydia is a bit older we might go up the chairlift and see what awaits us.